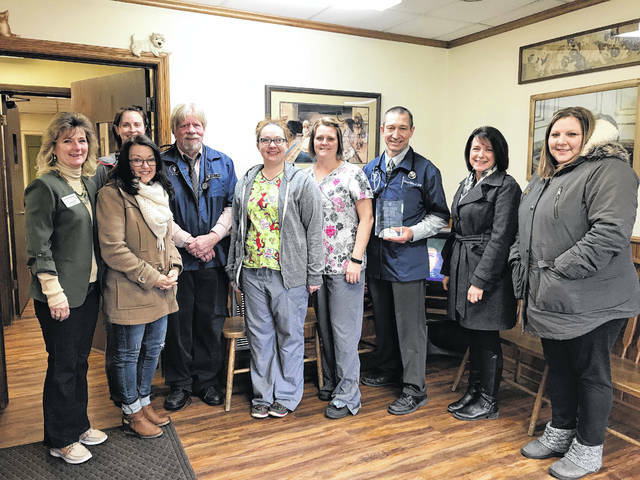 The Fayette County Chamber of Commerce Ambassadors recently recognized the Fayette Veterinary Hospital as the February Business of the Month. Dr. Gary Junk and Dr. Daryl Waits, Jr. recently celebrated 30 years of AAHA accreditation and 70 years of business in Washington C.H. They provide your best friends with the best vet care, offering boarding, house calls and surgery, along with all other vet needs. https://www.recordherald.com/wp-content/uploads/sites/27/2018/02/web1_IMG_0509.jpgThe Fayette County Chamber of Commerce Ambassadors recently recognized the Fayette Veterinary Hospital as the February Business of the Month. Dr. Gary Junk and Dr. Daryl Waits, Jr. recently celebrated 30 years of AAHA accreditation and 70 years of business in Washington C.H. They provide your best friends with the best vet care, offering boarding, house calls and surgery, along with all other vet needs.